On Thursday, Jan. 3, The New Gallery held the launch of an exhibition titled, Race Issues. Race Issues is a comic series created by Eman Elkadri an Information Design student at Mount Royal University. The project was created with the Canadian Cultural Mosaic Foundation, in partnership with ActionDignity Youth PLACE Program. 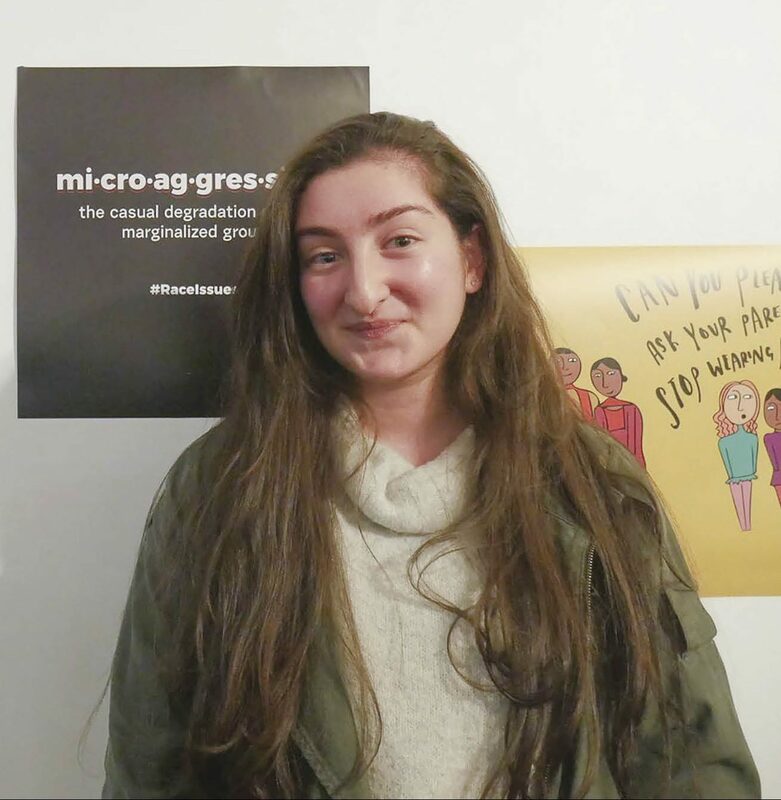 “Race Issues is meant to be an educational opportunity for those who do not know what a microaggression is and just how deeply microaggressions affect visible minorities,” says Elkadri. According to the Canadian Cultural Mosaic Foundation, because microaggressions are harder to recognize than blatant racist remarks, they happen very often. A few of these microaggressions include the classic, “Where are you really from?” and, “Wow, you’re really well spoken for an immigrant.” Each microaggression was taken from interviews of racialized youths in Canada. Elkadri gained inspiration to create Race Issues from a sociology class in which her professor made the class speak about racism. Elkadri says that many people left the class angry and uncomfortable — but she had a different experience. Instead, she became aware of how little people knew about racism and she wanted to continue the conversation. “We can’t pretend that racism is still not a thing. It still exists, microaggressions happen all the time and we need to hold people accountable,” says Elkadri. Because of this, Race Issues was the perfect opportunity to open the conversation about racism and microaggressions. She worked with the Canadian Cultural Mosaic Foundation, a not-for-profit run out of Calgary, that works to mitigate racism through education and promoting multiculturalism. The project took a year and a half to complete. This isn’t the first time that Calgary has experienced the mingle between art and race. The New Gallery, an artist-run centre in Chinatown, is known for supporting exhibitions that focus on race. It is a space for contemporary art, which brings forth the question: as we shift into a more contemporary artistic world, are artists given more space to create art about race? Elkadri says that the beauty of art is that there are no restrictions, meaning artists are able to use their creativity to tackle social injustices — including race. One of the artists that Elkadri admires is Jean-Michel Basquiat because of his courage to include race in his art. Basquiat was a Haitian and Puerto Rican artist whose success took off in the 1980s, when the art world consisted almost only of white people. Through his art, he tackled his personal experiences with racism as an artist of colour and, through this, generated conversations surrounding racism and art — something Elkadri aspired to do. Elkadri’s hope to open the conversation about race and microaggressions flourished during the opening exhibition of Race Issues. She welcomed attendees to write their own microaggressions on a poster, gaining many responses. The last microaggression is one that Elkadri has experienced frequently throughout her life. She says that when she was younger, she saw it as a compliment because it made her feel like a true Canadian. “Looking back at this, it makes me sick to my stomach and sad that society has made people feel that I must act and look a certain way in order to fit in,” says Elkadri. Being open to conversation about racism and being “that friend” who constantly calls people out on their microaggressions and racist comments, is what allowed Elkadri to realize that being proudly Lebanese does not mean she is less Canadian. Through her art, she wants to create these learning opportunities for others who are in the position she was once in. Elkadri says she’s looking forward to creating more art surrounding race in the near future, including more pieces on her personal experiences as a Lebanese-Canadian. You can find Race Issues at https://www.slideshare.net/CanadianCMF/race-issues-comic-meme-series-about-microaggressions.